If you love hidden green spaces — or are an avid whitewater paddler — you might know the spot. The press release calls it 1 Fleet St.; exact location is at latitude: 45.417702; longitude: -75.71154. Find it on Google Maps by searching “The Pump house Whitewater Course“.) It’s been awhile since I have personally been to the spot where thrill-seeking paddlers congregate, so I won’t give anecdotal directions — but I will say that if you head there this weekend it will be easy to find, as paddlers, support crews, volunteers, judges, and spectators will be there for the Whitewater National Championships. Unfamilliar with the sport of whitewater canoeing and kayaking? I have always thought of it as a bit like downhill skiing: the sport is difficult enough simply to stay alive and uninjured. But for many, that’s not enough. Enter the slalom course and other obstacles, which see paddlers racing through a tough, tight course set by ‘poles’ that dangle from aerial lines over the water. But don’t take my word for it — check it out yourself when the best in Canada race in the Whitewater National Slalom Championships. Races start 9:30 a.m on Saturday, Aug. 5 and Sunday, Aug. 6. And because some people need to make things even harder, here’s Olympian Cameron Smedley doing the slalom course at the London 2012 Olympics — without a paddle. Smedley gave a demo run through the event course earlier today at a media event, which also served as an unveiling of a sparkling new structure for the whitewater community. So if you need a break from the cheering and the thrill-seeking spectacles of whitewater paddling, take a stroll around the spectacular new clubhouse that was built this year for local group Ottawa River Runners. The structure, designed by Hobin Architecture and built by David Lynch of Globe Custom Construction, replaces shipping containers that the club formerly used for storage and change rooms, and brings attention to this growing sport. In the past, access to the river was precarious at best, with rickety stairs and crumbling banks. 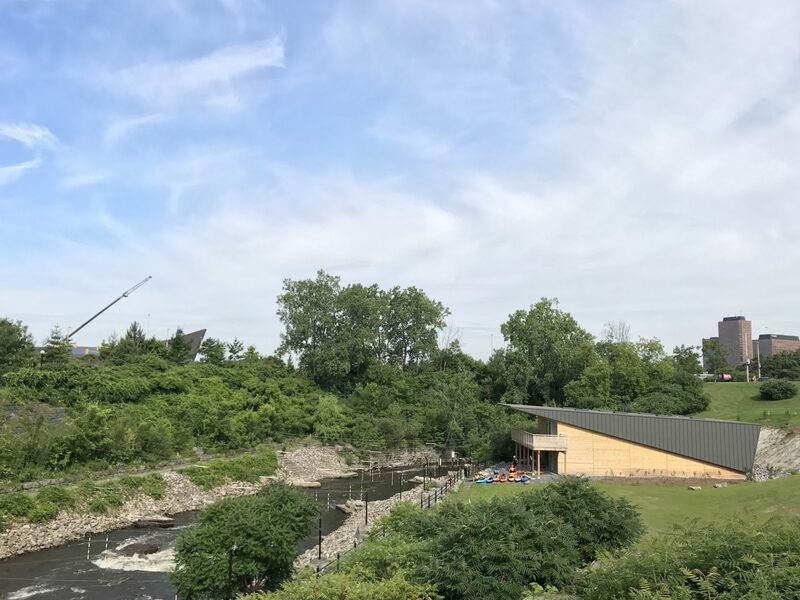 But the River Runners, the National Capital Commission, and Hobin’s team saw the potential: for years, it was one of only two whitewater training courses in Canada. “The site has come a long way,” says Doug Brooks, a partner at Hobin Architecture Inc. whose son is a former member of the Quebec team whitewater team. (In fact, the builder, Globe Custom, was also fuelled, in part by an interest in the sport, as president David Lynch is a former whitewater paddler.) That’s how the partnership began — Brooks saw the potential in the space, not to mention the risks associated with letting nature take its course. Initially, the team at Hobin worked with the River Runners on a pro bono basis to pitch the development of the area to the NCC. A $150,000 grant from the Ontario government followed, and what was once doomed to become a culvert is now a world-class training facility — complete with a modern clubhouse powered by rooftop solar panels.